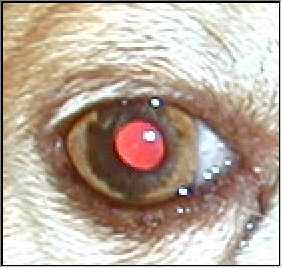 red eyes in pets and people in a photograph. 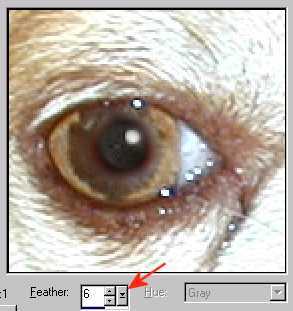 In today's tutorial we will using the new Red Eye Removal Feature in Paint Shop Pro 7. The Holidays are upon us and that means Pictures. Lots and lots of family photos and probably some pet photos. Even with a great camera, be it digital or otherwise, in our enthusiasm and haste we might forget to turn on the Red Eye reduction flash feature. We invariably end up with terrific but ruined photos because everyone has those devilish red eyes! With PSP 7 we can get that red out efficiently and quickly and return even the most the flawed photos to respectability. Click on the image on the left to open the larger version to work on in PSP. Right click the larger image and save as Taco.jpg on your hard drive. 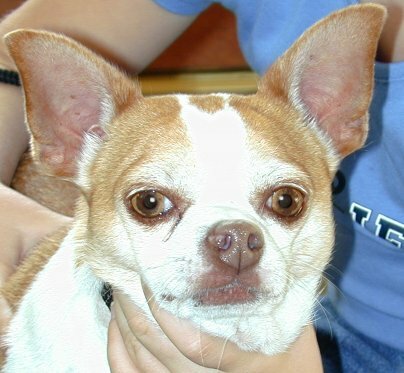 Using this photo of a stray dog I took with a digital camera, we will fix up his eyes. Click on the word Effects on the Menu Bar at the top of PSP 7. Pick the new area, Enhance Photo from the first flyout box then Red-eye Removal at the bottom of the second flyout. This opens the Red-eye Removal dialog box. It's a big un! see below. 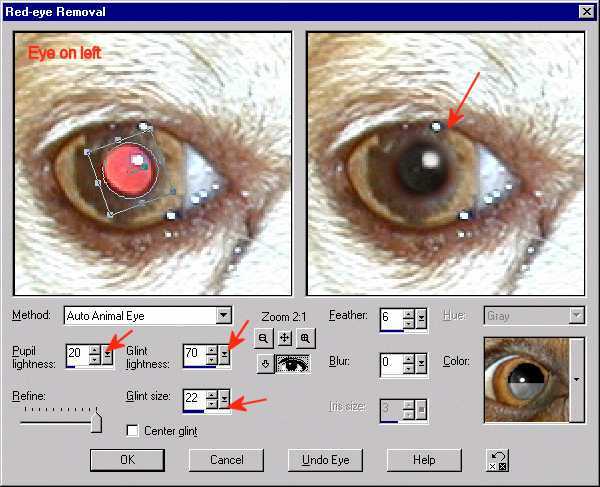 Since we are doing a dog, in the Method box, where Auto Human Eye is picked by default, click the down facing arrow and pick Auto Animal Eye from the list. Next click on the Color drop down box on the right side of the dialog box, currently show a cat eye and pick door number 3, Black dog eye. Click the 4 headed arrow mover tool just below the word Zoom 1:1 and move the view window over the eye on the left. It would probably be a good idea to click the zoom in tool once to isolate the eye itself. I do a better job when I zoomed in. Move the cursor into the preview panel on the left and click drag a circle starting from the center of the red eye out. Don't worry if its not perfect, we can move it later. Then use the handles on the bounding box to adjust the eye area. Grabbing and moving from the middle, with the cursor as a 4 headed arrow, moves the circle. Grabbing a corner handle and dragging resizes the circle in all directions evenly. Pulling on a side or top handle resizes the circle in one direction only, either horizontally or vertically. Use the straight handle in the middle to rotate the eye circle. See below. The trick to positioning and sizing is making the circle cover as much of the red as possible and still look natural in the preview on the left. Don't worry if there is a bit of a red band left around the eye. Remember, if you are working zoomed in there is a nice margin for error. 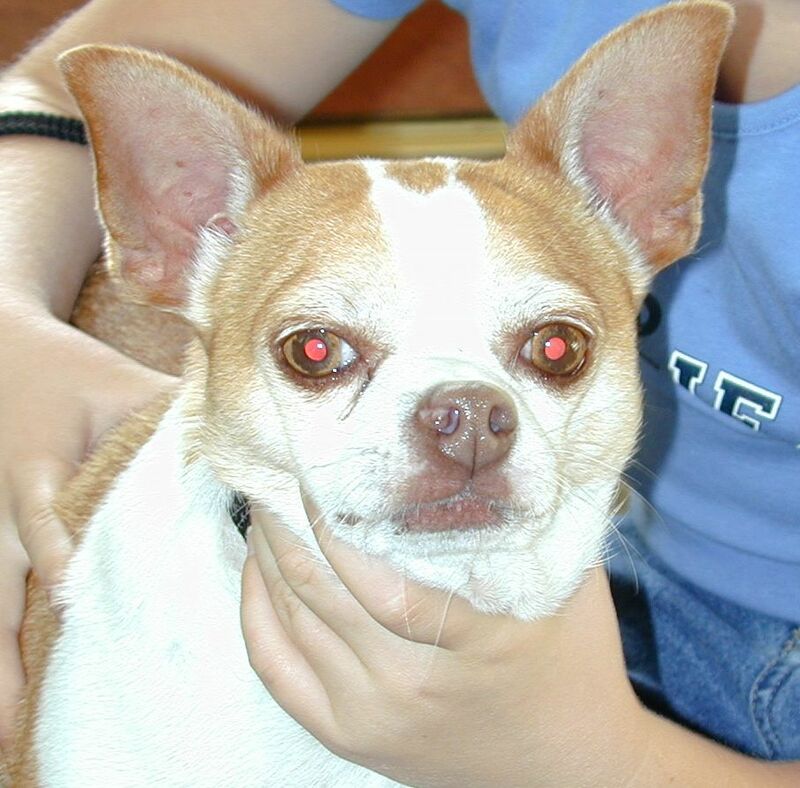 On the main image you can barely see the red band left around the eye, but we will get rid of it anyway. Back to the dialog box. I used a feather setting of 6 in my example. Previewing on the main image helps get this setting right. Next adjust the Glint, the shiny white dot in the eye. Since this photo is pretty bright, we ought to up this from 60 to about 70. Then adjust the glint size up to about 22. See below. This looks just about right for the eye on the left. Now to do the other eye. PSP lets you do both eyes, or 4 eyes or 8 eyes in a photo at the same time. Here is a caution though... Each time you drag a new eye circle, you get a new eye circle If you drag a circle by accident, one you don't want, press the Undo Eye on the bottom of the dialog box, to erase the last circle you made. Using the mover tool in the middle of the box under the word zoom, move the view to the eye on the right. 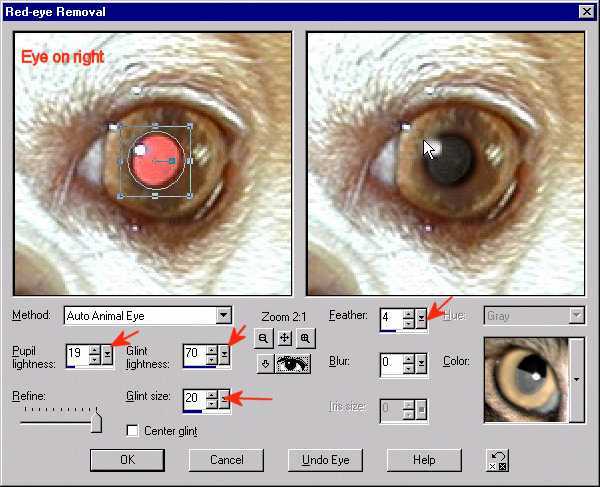 Using the same Auto Animal Eye setting and dog number three from Color box, drag the second eye circle and work on it as before. Resize and rotate the circle since the eye is a bit more elliptical. Then position it as accurately as possible. This looks pretty good, except that the glint is pretty blurry since its on the edge of the pupil, in our feather zone. One way, by reducing the Feather from 6 to 3, helps the glint but leaves the red band around the eye. Compensate by increasing the size of the eye circle in the left pane of the dialog box, and reposition. Another way is to draw that second eye circle and press the reset button on the bottom. Then redo that eye with all new settings. :) Reset returns the setting values to their defaults. For that eye circle only! Starting over on the right side eye, I used the following settings, Pupil lightness 19, Glint Lightness 70, Glint Size 20 Feather 4. I usually leave blur alone unless my original image is somewhat blurry. See below. Pretty nicely restored thanks to PSP! That's all very well and good but what about Human Eyes? After all we photo our friends and family more often than our pets don't we? Let's take my young niece as an example. For your own use, right click the image on the left and save to your harddrive as niece.jpg. Open it in PSP7. I am going over this one quickly, giving you a few hints and let you fiddle with it on your own. There are many settings on the Red-eye removal area to play with. 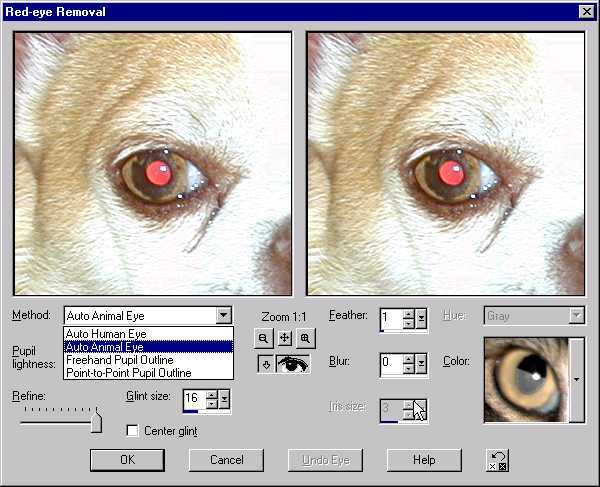 Open the Redeye Removal dialog box, by clicking in Effects on the Menu Bar and Enhance Photo then Red Eye Removal. OOPS, we don't need the Black dog eye, or auto animal eye either. She is a very sweet little girl. 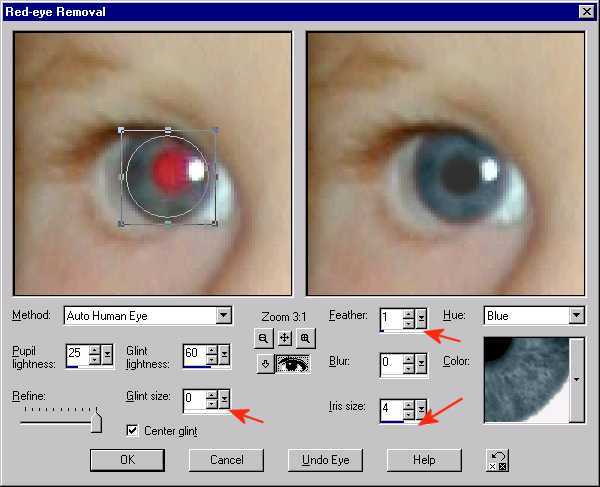 Pick Auto Human Eye from the Method drop down box. Then on Hue on the left, which was greyed out with Animal, Pick blue from the drop down box. In the color area, you have a lot of options! I picked number 14, cornflower medium, as my starting point, but you might find a better choice as you go along. 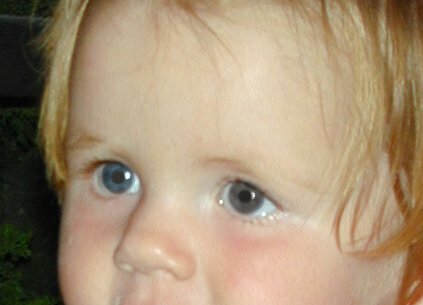 Anyway, With Human Eyes, you can actually make those brown eyes blue, and remove redeye at the same time. 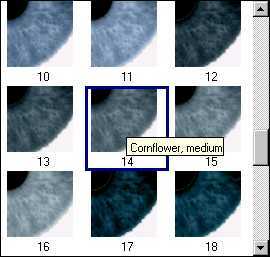 PSP7 gives you control over the Iris in human eyes. What this means is if you circle the whole eye, not just the red pupil, you can make the pupil bigger or smaller by adjusting the Iris size as well as changing the color of the Iris. See below. I removed the glint altogether, by moving the slider for Glint size to 0. The glint from her regular eye is plenty. No need to add to it. Note how my eye circle takes up most of the eye, and how I reduced the feather to 1. With the Iris size at 4, my niece's eye look pretty natural. For the other eye, however I changed the color and the settings, just for fun. No red eye left, but she sure looks weird. The settings for the human eye require lots of practice to get them adjusted just right. Practice Practice Practice can make great photo out of one destined for the recycle bin! Tutorial and Images © 2000 3D Workshop, Inc. All rights reserved. For personal use only. No part of this tutorial may be further distributed without express permission of the Author. For information please contact 3D Workshop, Inc, or HOST Comp Khiba on AOL.